I have a Replica Flywheel in Blue bought from Peter Mathews many years ago.It is a perfect replica in every respect, beautifully made and runs as straight as a die.I have an original and compared it to the replica its a no brainer the replica is perfect in every respect. I have just come across this item. 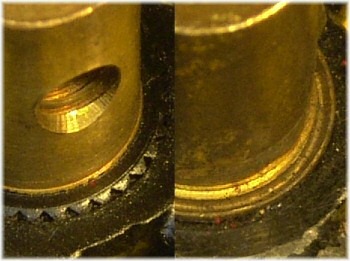 I have a double-tapped brass boss flywheel in black which I inherited years ago. 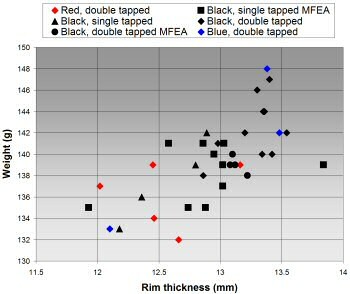 I have measured the overall diameter at 2.757in (70mm) and the wheel rim width at 0.525in (13.35mm). Hope this info is of help. Toys Past and Present of south Africa manufacture and sell part No 132 Flywheel. 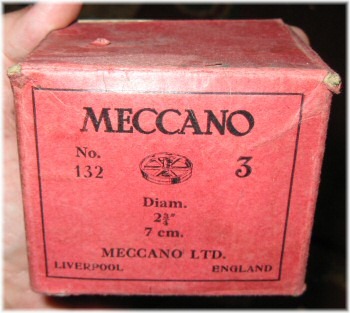 Go to toycollectorscorner.co.za click on Meccano Parts. Hard lead is alloyed with 6%-18% antimony, which increases the strength of the lead. The addition of only 1% Sb or 3% Sn increases the strength by 50%. 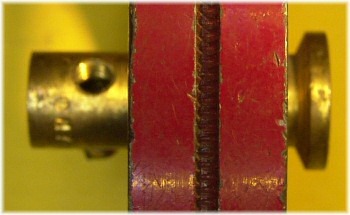 Hard lead is used for battery plates. I have, what I believe to be a South African Replica. It is easy to identify as it is not stamped with any lettering at all. It weighs about 138 g and the groove in the rim (12.1 cm wide) is not as sharply defined as those in the photos. It would have been dropped from the No. 10 because it was not used in any of the models in the manual. It was probably dropped from the complete list of parts during the Korean War re-evaluation of the range because it was expensive and not particulary useful. Had it been re-introduced at the time. it would still have been painted with paint containing lead. Do the Transvaal Meccano Guild of Johannesburg, South Africa, replica flywheels (Ref;MM July 1976) count as suitable for inclusion in "Variations & Oddities" as per the WRI Channel segments for p/n.119? Are they easily distinguished from Binns Rd production, or are they faithful facsimiles? p.s. Al Barton has speculated that the awareness of lead poisoning may have contributed to the withdrawal of this item. It's a pity that a brass version wasn't introduced instead.